» Hocus Pocus Lights! Camera! Vegan! Amuck! Amuck amuck amuck amuck a–oooof! 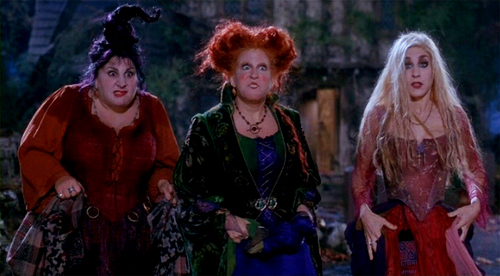 I thought it was time for another family-friendly movie, and I don’t think there’s a better Halloween kiddie movie than Hocus Pocus (sorry, Halloweentown fans). 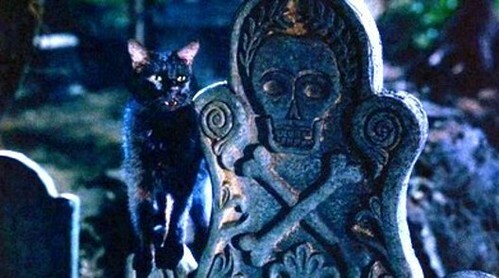 The witches are a little scary but more goofy than anything, there’s an adorable talking cat, a cute boy, and the bullies get what’s coming to them. And despite being a PG movie, I think most of the jokes are pretty funny. The movie received a lot of bad reviews when it first came out, but after years of being in heavy rotation on the Disney channel it’s now a cult favorite. Also, it’s Bette Midler’s favorite movie that she’s even done! I would wager a guess that her least favorite is Drowning Mona. Trivia bite: The song that Sarah Jessica Parker sings in the movie is an Edgar Allen Poe poem, not an original song. Back in the old days before tofu, three sister witches are sucking the souls out of children, and they turned one into a cat who can’t die, because they’re meanies. They were hung, but left behind a curse that if a virgin lights a certain candle, they can return and have one last shot at living. Like that Margaret Cho joke about Charlies Angels, there’s the sweet one (Mary), the smart one (Winifred)…and then there’s the ho (Sarah)! Naturally, some silly virgin lights the candle, gets yelled at by Binx the talking cat, the witches return, wacky hijinks, etc. P.S. No matter what you might think, Max is not the hero of this movie. Binx is the hero! Viva la Binx! Since witches are all famous ladies, let’s look at the rest of the cast! Omri Katz doesn’t act much anymore, but we’ve all seen plenty of Thora Birch (American Beauty, Ghost World). Ernie (aka Ice) is the bully-turned-out-and-proud football player Larry from Buffy, and Doug Jones (Billy) has played many other made up creatures, including one of the Gentlemen from the Buffy episode Hush. Sean Murray (the human Binx) is a main character on NCIS. Penny Marshall and her brother Garry play a married couple, the witches think Garry is their ‘master’. Entree: I was really happy when I googled ‘vegan witches stew‘ and one immediately leapt out! Side: You don’t really need a side with a stew, but how about this pumpkin spice cashew cheese dip with your favorite vegan crackers or some raw veggies? Baby carrots can even be carved to look like fingers if you want to be creepy! Dessert: Did you know there’s a blog all about being a spooky vegan? I actually discovered this while doing my pre-MoFo research, check her out! And try out these awesome Halloween-themed sugar cookies. Another option would be to just eat some vegan Halloween candy or some of the seasonal Sweet and Sara marshmallows, straight out of the package.